Espresso is all well and good but it’s not an all-day drink. How about when you want to switch to longer and creamier latte or cappuccino instead? Well, luckily you won’t need a separate machine if you roll with any of the models we break down for you today. All these coffee makers come with a great frother so you can get your drink just the way you like it with relatively little effort. We’ll launch right in now with our reviews so you can streamline your buying decision saving time and money, both always in short supply. Our standout winner was the Breville Barista which is a first-class espresso machine if you love your coffee short and strong. While marketed as such, though, you can also make a mean cappuccino and latte giving you great scope from an industry legend. The manual steam wand allows you to dial things in a treat and you can build out longer, creamier lattes and cappuccinos to drink throughout the day. Build quality is robust with a brushed stainless steel finish looking great in any kitchen. The grinder is also stainless so it’s built to stay the distance while delivering premium results every time. Crowned with a 1600-watt thermo coil heating system, you’ll get gourmet, coffee shop-style drinks at home without the ruinous monthly bill. Whether you’re an espresso fiend or you prefer cappuccino and latte, the Barista Express excels across the board. This is a bean-to-cup coffee machine at its very finest. 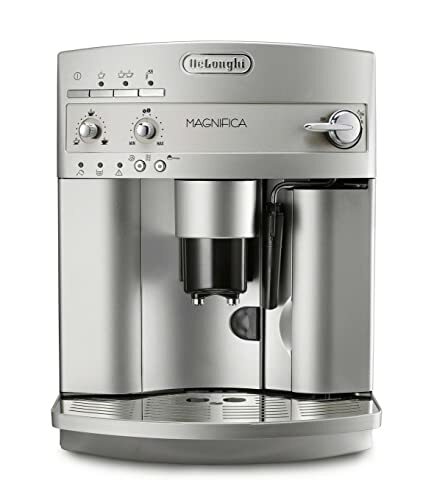 Coming in a very close second and now available at an exceptional discount, act quickly and you’ll get the steal of the year with the DeLonghi Magnifica. Sure, it’s still not cheap but you get remarkable performance from espresso through to longer, creamier drinks. 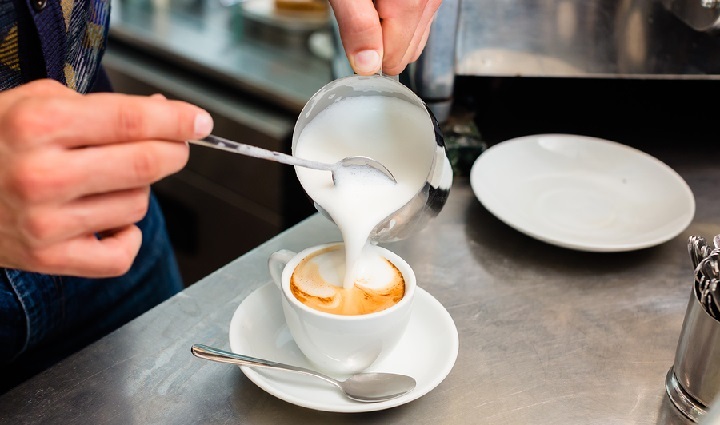 DeLonghi developed a proprietary cappuccino system so the steam and milk is mixed perfectly for a creamy taste sensation with minimal user input. With simple dials and buttons, you get few frills but quality is absolutely uppermost. And let’s face it, the coffee in your cup is what counts. Another direct brewing system, the onboard grinder lets you enjoy your beans at their very freshest. Medium roasts work particularly well in this machine. There are 13 settings to choose from so you can enjoy your grind size exactly the way you like it. The manual frother extends maximum control married to minimum effort for a winning combo. Whether you want a latte, cappuccino, flat white or macchiato, enjoy thick foam which will stay the course. Beyond these longer coffees, you can also program in espresso and the intelligent machine will remember all the key metrics so your preference is replicated fuss-free. A rock-solid performer in all the categories that count, move quickly and capitalize on that aggressive discount! Next up we’ve got something for those of you on a tighter budget. 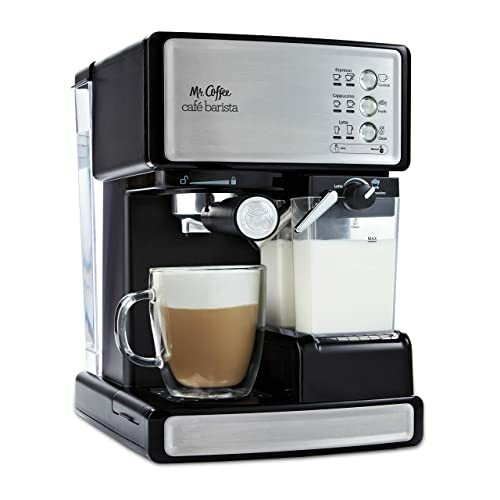 Mr Coffee is synonymous with top-notch machines at bargain basement prices. This combined espresso and coffee maker continues that admirable tradition. 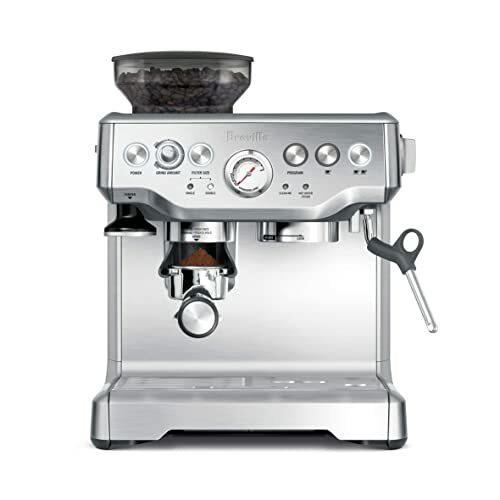 A semi-automatic, this machine offers cappuccino and latte alongside the classic espresso. For the latter, you’ve got the requisite 15-bar pump delivering the pressure you need for great short and strong shots. How about those longer coffees, though? Well, the automatic milk frother might rob you of a little control but you’ll be rewarded by complete convenience at the twist of a knob. The milk reservoir slides out so you can keep any leftovers in the fridge reducing wastage. A one-touch control panel means this machine is a breeze to use even if you’re not the biggest tech-lover. Whatever you preference of drink, you can opt for a single or double shot, perfect if you need an extra kick in the morning on a hectic day. The lengthy 26-inch cord gives you plenty of freedom with positioning while the removable water tank streamlines filling and cleaning. In the business of bringing affordable coffee into the home since 1970, Mr Coffee once again hits a clean home run with this fantastic and pocket-friendly 3-in-1 machine. We know from the glut of emails we receive that many of you embrace the simplicity and convenience of Nespresso pods. The problem is, there are so many machines at your disposal, choosing the best one can be intimidating. 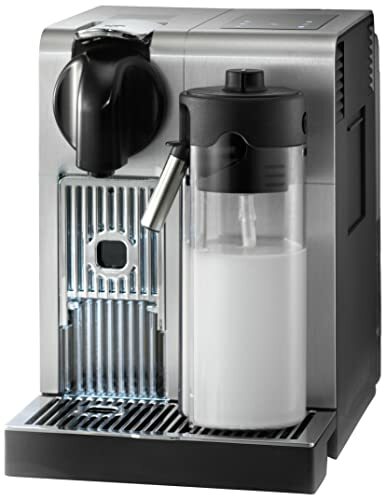 Why not start your search by looking at this DeLonghi-manufactured Lattissima? You’ll get all that capsule ease combined with the security of buying into a trustworthy brand at the top of their game. 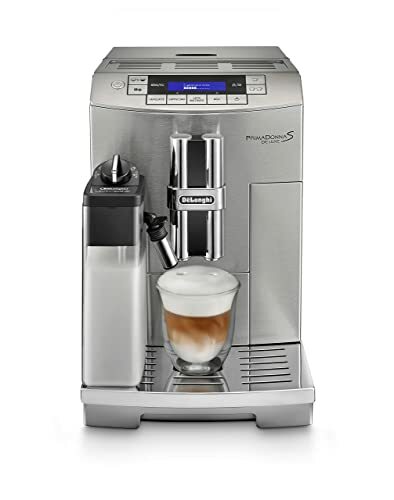 The beauty of this machine is the way Nespresso’s espresso expertise and DeLonghi’s Automatic Cappuccino system come together giving you the richest foam you need for your longer drinks without compromising the quality of those stiff, shorter shots. Choose between these using the sleek and responsive touch screen rendering operation as easy as 1, 2, 3. Finished in a slick stainless steel, this coffee maker sets off any kitchen counter while punching hard when you want coffee in a hurry. The aluminum Nespresso capsules are recyclable so you can enjoy the greatest coffee with almost no effort and no concerns at all about your environmental footprint. Keurig is the other default option if you want single-serve ease without compromising the quality of the coffee in your cup too badly. 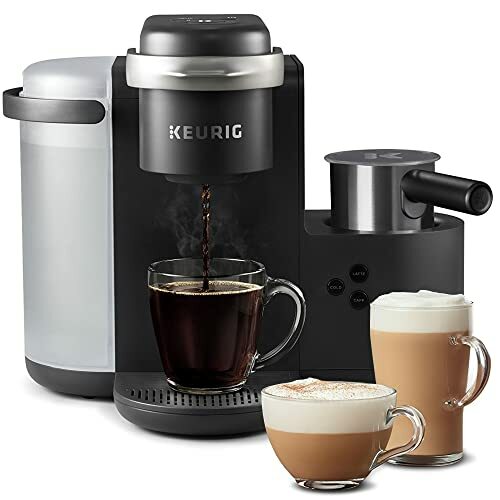 The Keurig range is broad but our favorite overall for the purposes of cappuccino and latte is the K-Café. Simply choose the K-Cup pod of your choice and slip it into the top of the unit. 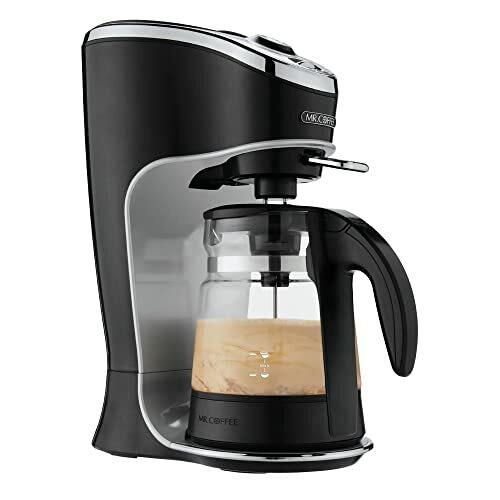 In 30 seconds flat, you’ll have a steaming drink in your cup with no hassle and no clean-up to contend with. The dishwasher-friendly frother allows you to whip up pretty much any type of milk including soy and almond. Choose from 6, 8, 10 or 12oz shots so there’s something for all the family. Sat above the choice of brew sizes, you get a pair of buttons, Coffee and Latte/Cap so using this machine really couldn’t be much simpler. The water tank is generous at 60z so you can brew enough coffee for 6 regular cups before needing to top up. The drip tray slides out to accommodate even taller travel mugs so Keurig covers all angles to cater for all preferences. Single-serve coffee is not for everyone. If you’re a fan, though, the K-Café is among the strongest options at your disposal. If you have a more fluid budget and you’re looking for a completely automated coffee making experience, there’s no substitute for the classic Breville Oracle Touch. We’ll state front and center that this machine is not cheap but the best things in life seldom are. What does it so well, then? Just swipe through the touchscreen whether you want espresso, cappuccino, latte, flat white or long black. From this point, the onboard burr grinder kicks in with 22g of dosed beans modeled after commercial coffee machines. With highly accurate PID technology, you’ll get the water at just the temperature you need for top-tier espresso and water pressure is optimized throughout extraction to eliminate any chance of bitterness or taint. 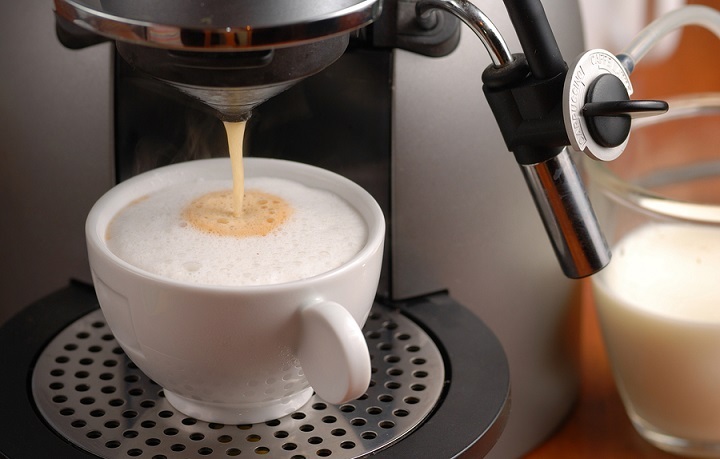 The automatic steam wand serves up a micro-foam to set off all your drinks, short or long. Fully-automatic machines polarize opinion. If you’re looking to dial in all elements of the brew, a more manual method like pour-over is better. 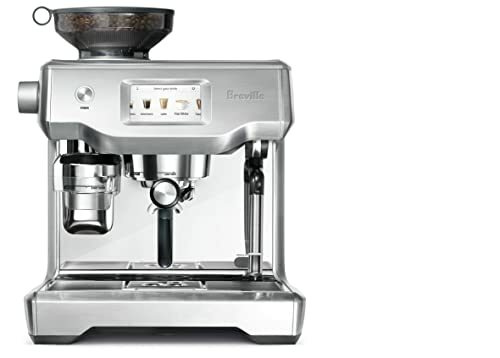 If, however, you’re cash rich and time poor and want a great degree of control but married to total convenience, this commercial-grade machine from Breville is a smart bet. We’ve got another entry from the ever-reliable Mr Coffee as we edge to the close of our latte and cappuccino machine reviews. This one-touch latte maker keeps things simple in the extreme with push-button functionality taking all the legwork out of making your favorite drink. If you want straight-up coffee or espresso, you’re in safe hands, too. It’s with latte and cappuccino where this machine comes into its own, though. Controls couldn’t be easier and in just 3 straightforward steps, you’ll have first-rate latte in your cup. If you’re stuck for ideas, you’ll get a recipe book thrown in. With 20 recipes to whet your appetite, there’s no excuse for bland coffee. Cleaning this latte maker is as easy as using it. Just decant any remaining liquid from the pitcher and wipe it down with a damp cloth. The carafe is not dishwasher-friendly so make sure you steer clear. Wipe the outside of the machine down and you’re ready to go again. Doing this after every use takes no time and will ensure you get plenty of service from your machine. While it’s absolutely not the most complex or versatile coffee maker, if you like your drinks long and milky and you prioritize convenience above all else, this is the obvious choice. It’s fantastic value so what are you waiting for? 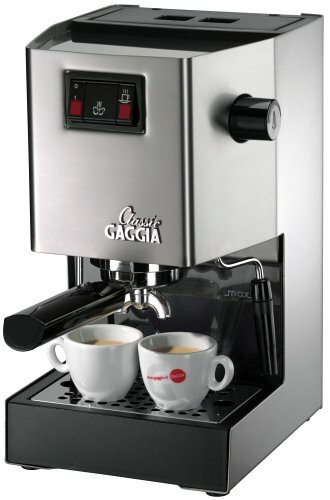 Next in line is the first of a pair of Gaggia machines, the legendary Brera semi-automatic. The brushed stainless steel aesthetic looks just as good in a minimalist or more traditional kitchen. Build quality is rugged, too. There’s a Pannarello wand giving you all the froth you need for the richest, creamiest lattes and cappuccinos. The intake hole blasts air directly into the foam for a delectable finish. You can use either whole beans ground in the integrated ceramic burr grinder or use the bypass doser for your favorite pre-ground. The interface and LED screen are a dream to navigate. Cleaning is equally straightforward. The brew group comes out for easy rinsing while the water reservoir and dreg box are also removable. Gaggia’s patented Adapting System ensures the machine remembers your preferences and evolves accordingly. Not only is the steam great for delivering lip-smacking latte or cappuccino, you can get it up to temperature in as little as 10 seconds. 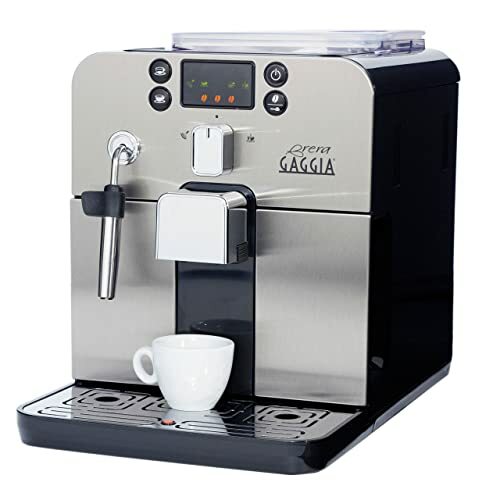 As we near the end of our hunt for the best cappuccino machine and the best latte machine, we’ve got another Gaggia for you, this time the more affordable Classic. Another semi-automatic, you’ll get that ideal combination of convenience and control. Like all Gaggia machines, the brushed stainless steel finish is eye-catching while delivering maximum lifespan from a machine built to withstand prolonged and heavy use. If you tire of the espresso this machine delivers in immaculate style, the Pannarello wand lets you whip up the greatest froth for those longer, milkier drinks. Although this is an entry-level semi-automatic designed for home use, you’ll get some valuable commercial features thrown in. The solenoid valve is modeled on coffee shop machines while all components are precision-engineered and highly durable. The basket and portafilter are also just like those you’d find on commercial machines but you won’t need to take out a bank loan for the Classic. Indeed, if you think about the cost of a daily (or even weekly) trip to Starbucks for your latte and cappuccino, the expense can be reframed as a genuine investment. While it’s not the most eye-pleasing of Gaggias, the Classic is a strong performer at a highly attractive price-point so why not give it a shot? We’ll tail off today with yet another DeLonghi. It’s tough to escape the stranglehold of this brand and, while the America Prima Donna is by no means the cheapest machine up for grabs, it stands up there with the very best. Touch-button simplicity means you can get the coffee you deserve even if you’re rushing around getting ready for work with no time to spare. The inbuilt burr grinder gets proceedings off to a flying start with freshly ground beans. Adjustable settings mean you can dial in the grind size to your exact taste. The control panel is super-responsive and the display can be read at a distance showing everything you need and nothing you don’t. For espresso, cappuccino and latte using DeLonghi’s LatteCrema System, you’ll get first-rate results whatever type of coffee you prefer. You can completely customize your drinks and relax since the machine recalls how you like your coffee then rolls out more of the same every time. We’re not here to urge you to buy something you can’t afford, but if you have the budget for it, the America Prima Donna is a prime investment for your home or even a small coffee shop. If you don’t know much about coffee, you might have been wondering why we heavily featured espresso machines in our hunt for the best latte maker and cappuccino maker. If you are a coffee aficionado, you’ll be well aware that espresso forms the base of these longer drinks so you need that to get things started. From that base, though, you’ll need to add perfectly frothed milk in varying degrees so we’ll walk you through getting that done the easy way now. It goes unsaid you’ll need the freshest coffee to get things started the right way. Whether you opt for a machine with an onboard grinder or you use a separate grinder, it’s always advisable to use whole beans and blitz them directly before brewing. With your coffee in place, you need to focus on the advantages of the different types of milk you could use. There’s no right or wrong answer here, just the right answer for you. Use more coffee and less milk if the quality of your coffee is prime. If you’re forced to use a lower-grade, flip this ratio and go heavy on the milk. Always start with cold milk and pour it into a cool pitcher in the correct quantity for your required drink. 12oz pitchers work well for drinks up to 7oz in size. With drinks between 7oz and 12oz, opt for a 20oz pitcher. Inject air into the milk while it’s cold then bury the tip and start steaming. If you want to learn how to present your coffees with those trademark flowers or rosettas, this video shows you how to create latte art in slow motion. Here’s a similar video outlining cappuccino art. Don’t think we’re being lazy here but you need to watch this as it’s almost impossible to explain in words something you can see in less than 2 minutes visually. So with that, you’ve got all the basics and beyond to create the best long, creamy coffees. As always, we hope you’ve got plenty of useful information from our quest for the best cappuccino and latte machines. When you’re making these longer espresso-based drinks, immaculate frothing is the difference between a taste sensation and a limp, flat disappointment. After today, you should have that covered. You should also have a nice and easily assembled shortlist with the grunt work taken out of your buying decision for you. If you have any questions at all on this or any other aspect of coffee, don’t hesitate to get in touch. We’re constantly busy putting the best machines through their paces, but we always have time for our readers and we’ll get back to you promptly. Also, if you have any suggestions for products you’d like us to investigate, let us know. We always value feedback and do our best to bring you exactly what you want. So hustle off and make yourself a nice latte and come back soon!